How to Bulk Select Upsell/Cross-sell items? A guide on how to apply the same Cross-sell/Upsell settings to a group of your products. Go to your LimeSpot Administration Panel. Click on Products > Product Tool option from the left hand side menu. Here you will see a list of all of your shop's items on the left panel. Click on a product and a panel with three tabs: Cross - & Upsell, Box Settings and Targeting will pop up on the right side. Click on Cross - & Upsell. Tip: You can easily search for your items based on keywords and navigate through the items' list page by page. Select the items (Primary list) that you would like to apply the same settings to by checking their checkboxes.NOTE: The first item you select is the reference product. The reference product's upsell/cross-sell settings will apply to the other products in the primary list. You will see a blue panel appear on the top right side of the settings including all checked items. 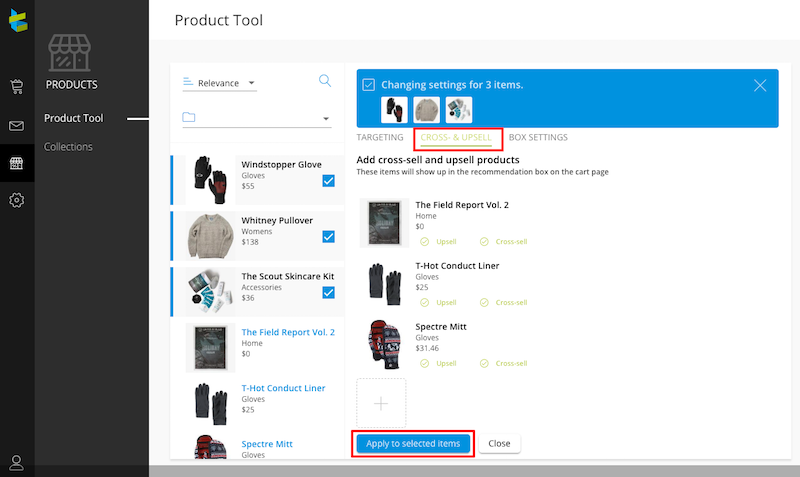 NOTE: You can remove items from the primary items list during any step of the Group Item Settings process by either unchecking their checkbox or clicking on its image in the right panel list except for the reference product. 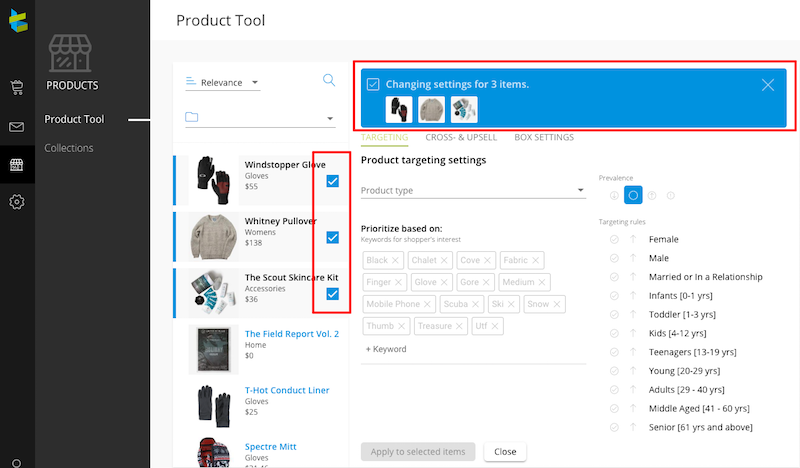 If you uncheck the box for the reference product, the whole bulk edit box will disappear. Once you have selected more than two items, you can begin editing by clicking on the Cross- & Upsell tab. The remaining item settings (Upsell/Cross-Sell/Related Items) process is similar to the Individual Item Settings explained above. NOTE 1: You can add/remove items to/from your primary list during any step of the Group Item/Bulk Editing Settings. NOTE 2: When you are adding a new item to the primary list after step 5, all of the group item settings will be applied to this item which cannot be undone. Click Apply to selected Items once you are done.